*opportunities for multi-year-level collaboration, self-directed learning and community engagement content that actively develops key life skills, such as financial planning, nutritional knowledge and goal-setting. We all want to empower kids, to offer them our ideas and encourage their own, so they can make informed decisions about their own lives and about the future of our planet. It’s great to find a resource about sustainability which does exactly that. In Make the Future! 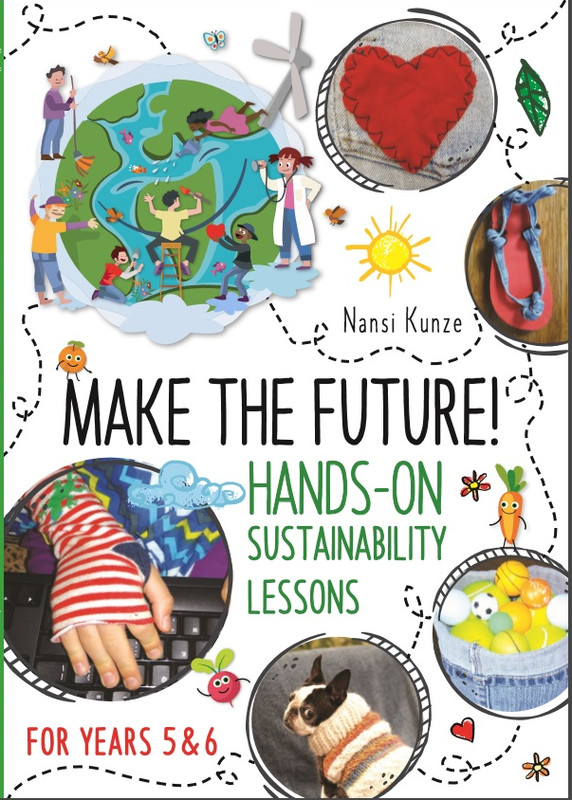 Hands-On Sustainability Lessons for Year 5 and 6 I particularly liked the emphasis on practical and useful activities.. Kunze has a warm, conversational “voice” that explains things clearly. There’s so much emphasis on making in schools - children can learn to code and even use a 3D printer if their school can afford one. But sometimes I think we might forget some of the useful low-tech skills our grandparents knew. Things like how to sew, how to patch something, how to replace a button, how to convert and recycle, how to make a yummy chocolate cake that includes carrot and zucchini, all tutorials covered within the resource. I also loved the way Kunzi had such a range of activities in the book, activities that involved kids in numeracy, literacy, thinking critically and creatively, information literacy - and group work, decision making, goal-setting, investigating in the real world, creating, even peer-teaching. There are frequent flashes of humour that I know students will appreciate, and the book design and graphic elements are colourful and attractive. Make the Future! has reproducible worksheets inside, something busy teachers will appreciate. There are sample pages to peruse at HBE’s website. You’ll also find password-protected resources for display available via directions inside the book’s front cover. You could pair Make the Future! with a free resource, Future Earth, which is available as a pdf on the Science Week website.